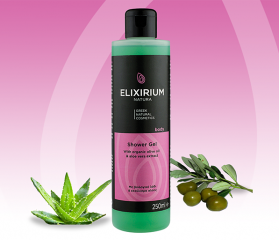 ELIXIRIUM NATURA - SHOWER GEL. HomeElixirium NaturaBODYELIXIRIUM NATURA - SHOWER GEL. With organic olive oil & aloe vera extract. Shower gel with organic olive oil and aloe vera extract with moisturizing, soothing and stimulating action. Deeply cleanses and nourishes the skin. Ideal for everyday use. Use: Apply gel to wet skin lather then rinse thoroughly. Συστατικά/Ingredients : Aqua, Sodium Laureth Sulfate, Cocamidopropyl Betaine, Cocamide DEA, Glyceryl Oleate, Coco Glucoside, PEG-7 Glyceryl Cocoate, Phenoxyethanol, PEG-120 Methyl Glucose Diolate, Parfum (Fragrance), Benzyl Alcohol, Benzoic Acid, Olive Oil PEG-7 Esters, Aloe Barbadensis (Aloe Vera) Leaf Juice, Dehydroacetic Acid, Polyquaternium-39, Olea Europaea (Olive) Fruit Oil, Citric Acid, Linalool, Lilial, Amyl cinnamal, Hydroxycitronellal, Sodium Sulfate, CI 19140, CI 42051, CI 42090.